It's a bummer that we're not getting a theatrical release from Pixar Animation this year, but hopefully they'll make up for it next year with Inside Out, the heady story of the conflicting emotions inside a young girl's mind. And along with that film, as has become customary, we'll be getting an original short film from Pixar as well. It's called Lava, and the film is a 7-minute love story between two mountains named Uku and Lele (like ukulele, get it?). The film will actually premiere at the Hiroshima International Animation Festival in Japan next week, and before the film's release, a first look photo shows off one of the happy volcanoes. 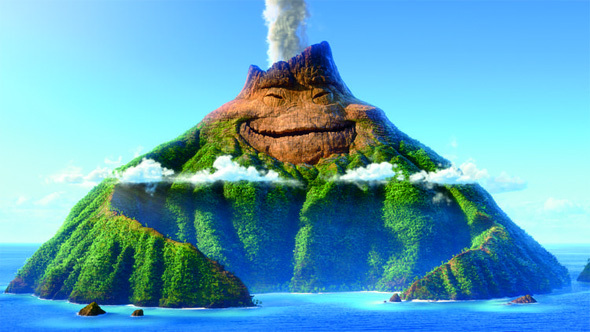 Unfortunately, the rest of us won't get to see Lava until Pixar's Inside Out hits theaters on June 19th, 2015 next summer. The short film is directed by James Ford Murphy (an animator who has been working on Pixar films since A Bug's Life), who actually came up with the idea for the short more than 20 years ago while on his honeymoon in Hawaii. Murphy says, "I thought it would be so cool to fall in love with a place who’s also a character. I wanted to make Uku appealing and likable but also look like he’s been carved out of lava flows." As for the music in the film, Murphy learned to play ukulele and wrote the titular love song in the film, and it's performed by Hawaiian musicians Kuana Torres Kahele and Napua Greig. As always, we can't wait to see what Pixar has come up with this time. Cool?